Do you like dressing up smart and fancy? Do you want to show off your unique style at all times? Are you looking for the perfect accessories for that special occasion? Do you need to find a stylish gift for your loved one? The Y-back suspenders and bow tie set is the stylish answer to your problems. The matching set comes in 12 different colors to suit your style and mood. The suspenders and bowtie come in bright and funky colors for a unique casual look, pastels that are ideal for weddings, and more discreet and serious colors for the fancy businessman. The set is perfect for the groom and the groomsmen, and any black tie event. The set's elegant design will elevate your style, no matter what's the occasion. The elastic suspenders are very easy to adjust to any size and they are very comfortable to wear for long hours. Enjoy the comfort and convenience without compromising your sense of style. The metallic clips of the suspenders are very strong and durable, so you can rest assured that they are very reliable and they will stay in place. The bowtie is pre tied and will never come off, so you will not have to worry about it. Show your loved ones you care about them with this elegant gift. The suspender and bow tie set will make the perfect gift for all the special gentlemen in your life. The suspender and bowtie set comes with a 100% satisfaction guarantee, so if for any reason you are not fully satisfied, you will get a full refund. 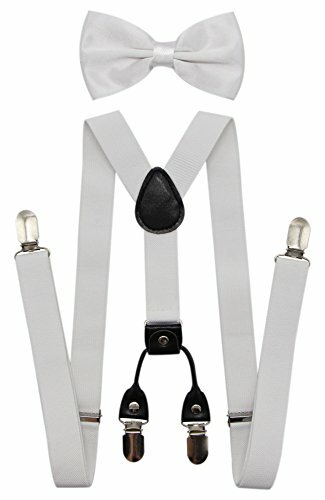 EXCELLENT QUALITY - These adjustable solid suspenders and bow tie set are made of high quality materials and are very durable. Black suspenders are fully adjustable and comfortable to wear. Great for any trousers, jeans, shorts. The pre-tied bow tie is made of polyester, they are durable enough to be used to several years. This set works great and can be wear for formal, or casual wear both. Our suspenders are long enough 48 inches, 1 inches width and conform to your needs! AN EXCELLENT GIFT SET - Elegant, durable and comfortable, our Suspenders + Bow Tie set will make the perfect gift to the college student, the bridegroom, the graduating student, the performing musician! Offer it to your friend, brother, father or co-worker on their Graduation Day, Father's Day, Christmas or on their birthday and have the lucky recipient thankful for your excellent taste! These cool suspenders are 100% perfect! - Extremely strong clips, nice wide elastics ensure secure and comfortable fit. You could use them all the time and they will never came off even with bending, falling, ski lift usage, even sledging! A pre-tied bow tie should achieve two functions. It should look good and be easy to put on. The appearance of this bow tie will really good and it looks good with a wing collar. The band is made of material, with no elastic, and the clasp blends in well. GREAT MATCHING - Not Exactly Same Colors of All Bow ties and Suspenders. Multi color for choose to match different color shirt, Available in 12 Colors to best meet your taste and wardrobe. In a simple and classic style, these bow tie and suspenders can be a perfect accessory for all occasions. NO QUESTIONS 100% MONEY BACK GUARANTEE - We are sure that you will love our suspender sets, which is backed by our 45-day exchange and return policy. If, for any reason, you are not absolutely thrilled with it, we will be glad to fully refund you.